Highly successful spin-off of Beverly Hills 90210 followed the exploits of a group of 20-something's from various backgrounds living in a Los Angeles apartment complex. Full of fashion, beauty and relationship dramas. Melrose Place Season 2 starts with Alison receiving some threatening letters and Amanda hitting on Billy behind her back, while Jane files for divorce. 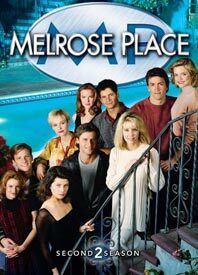 This Melrose Place DVD Boxset boxset contains all 31 espisodes in the second season on 8 discs.